The GBP/USD refreshed local highs at about 1.5550 yesterday morning but failed to hold at that level and moved downwards straight away. The US consumer price index released yesterday raised the demand for the American currency and the pair dropped to a level of 1.5400. Let’s look at the four-hour chart. Tenkan-sen line has crossed Kijun-sen from above above the cloud, forming a signal to sell. 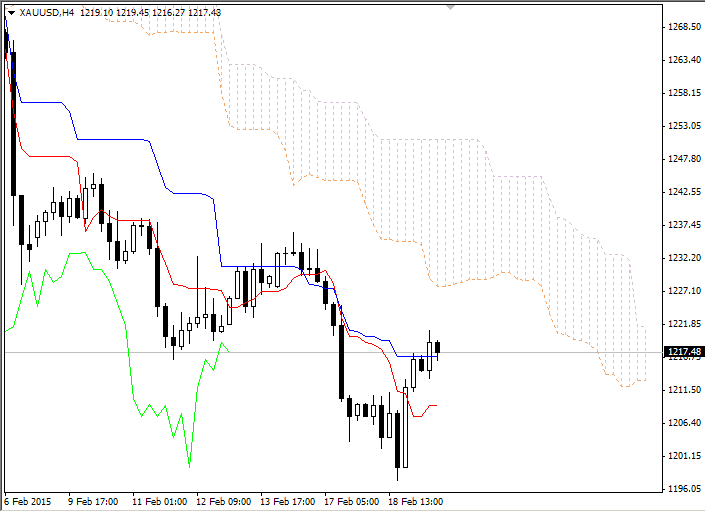 Chinkou Span line has crossed the price chart from above, current cloud is still ascending. 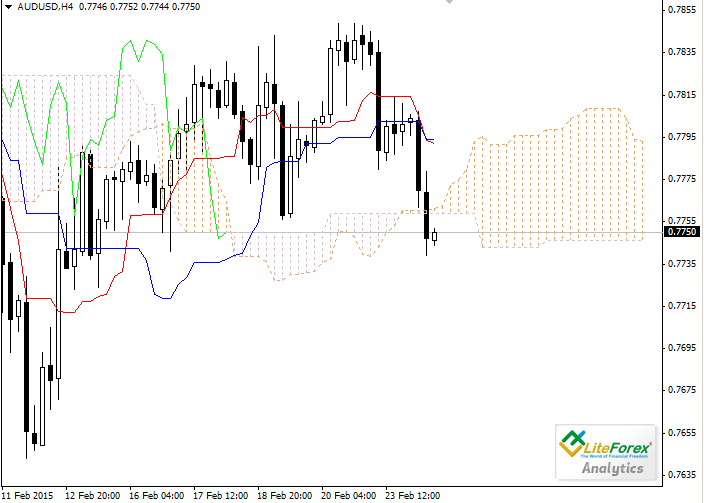 The pair has broken down the cloud and is moving towards 0.7680. 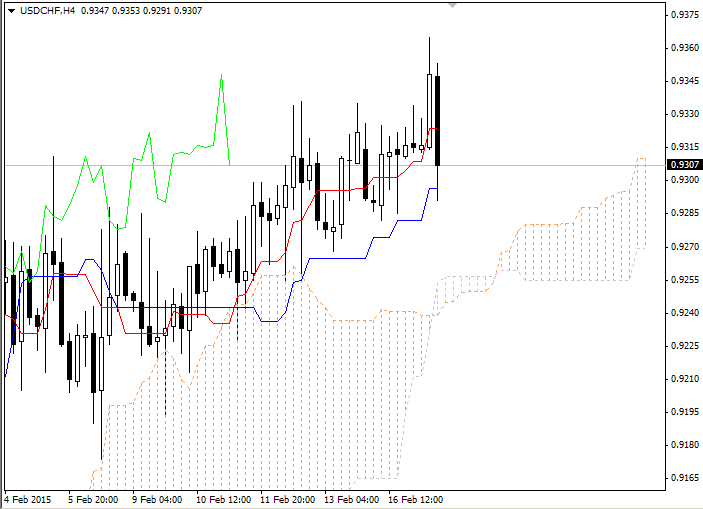 The closest resistance level is the lower border of the cloud (0.7759). Monday saw the euro quickly give up on the gains it initially made against the dollar as worry over the unfolding financial crisis in Greece crept into the markets. The previous week was quite volatile for the GBP/USD that traded in a range of 1.5340-1.5465. On Wednesday, following the publication of data on the UK labour market, the pound managed to rise to a resistance level of 1.5465, but did not break it down. On Friday, the British currency lost points against a backdrop of negative data on retail sales. The trading session closed below 1.5400. Let’s look at the four-hour chart. Tenkan-sen line is above Kijun-sen, they are both directed upwards. Chinkou Span line is approaching the price chart from above. Current cloud has recently reversed from descending to ascending. The pair is trading within the cloud, borders of which become support (1.1346) and resistance (1.1402) levels. Let’s look at the four-hour chart. Tenkan-sen line is above Kijun-sen, they are both horizontal. Chinkou Span line is approaching the price chart from above; current Kumo-cloud is ascending. The pair is slowly rising, being corrected along the way. Tenkan-sen line is the closest resistance level (0.9234). Support level will be Kijun-sen line (0.9296). GBP/USD has been growing within a range of 1.5196-1.5422 throughout the past week. As a result, the trading session closed at 1.5396. This week started with a positive gap that was overlapped afterwards. Then the pair resumed growth. Yesterday the pair slightly grew against a backdrop of positive data on French and Italian manufacturing production volumes. Then unfavourable macroeconomic data was released in the US: the small business optimism index dropped to 97.9 points, and new non-farm payrolls reduced to 5.03 million. The British currency continues to trade in a range of 1.5100-1.5000 against the dollar. The upbeat data on UK production activity index and business activity index in the construction sector were not enough for the pound to recover substantially. Let’s look at the four-hour chart. Tenkan-sen and Kijun-sen lines have merged and stay horizontal, reflecting the uncertainty of the market. Chinkou Span line is approaching the price chart from above; current cloud is descending. 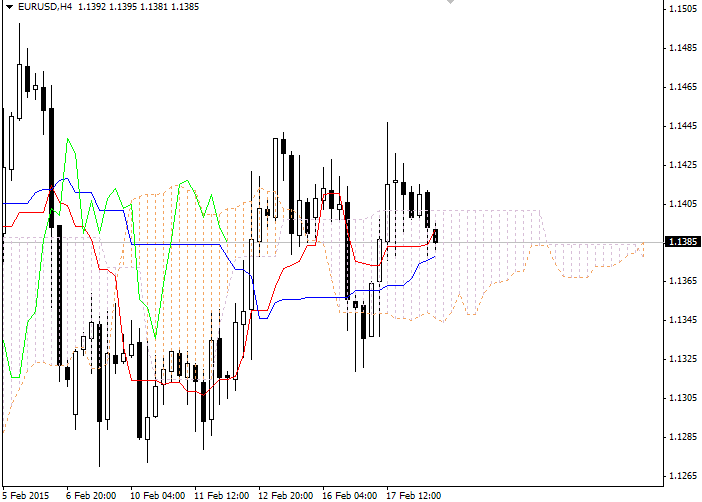 The pair is trading within the cloud, borders of which become support and resistance (1.1445) levels.